Discover the rare and untouched gemstones in the vast jungles of Africa during this uk online slots adventure. There’s also an interesting add-on card game that allows you to cash in your bounty and win up to 3 million gold coins. Developer Eyecon has been running as a successful computer game company for over 20 years. Two years after it was founded their online casino took off and their first slot game was introduced in 2003. They are one of industry’s leading online slot game developers for bingo and casino based websites. Eyecon have produced over 60 high quality popular and timeless games available to players across many online gaming platforms. Each online slot games is created to provide every player with a game they can enjoy for a long time and each year more players and playing unique games with Eyecon. 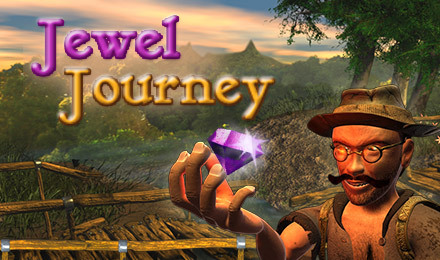 Head for a journey down the forest with the professor to find precious gems and be rewarded big bucks. The game is a 5-reel 25 payline slot game which takes you on an adventure to find gems and protect your team from the tiger. Symbols within the game include a professor, a tiger, a map, purple gems, a backpack, a water pouch, flowers, blue and green gems, a dagger, torches, shoes and a hat. The wild symbol in the game is the purple gem which substitutes all symbols but the tiger, the professor and the map. The purple gem will also double the prize value in a winning combination. The highest paying symbol in the game is the Backpack symbol where 5 of a kind winning combination will reward you with 1,000 credits. 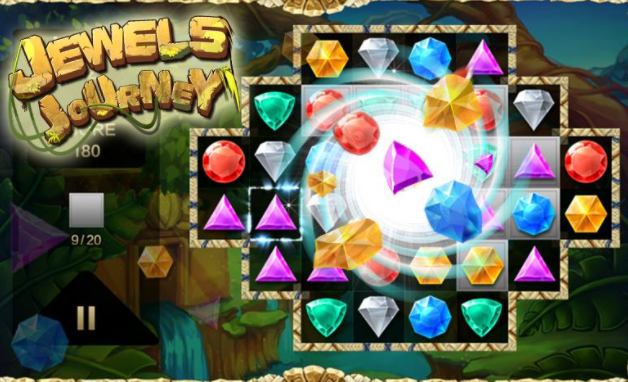 Jewel Journey Slots comes with 4 superb feature including the Great Escape, Free Spins, Match and Win and Gem Select features. The Great Escape feature can be triggered when 3, 4 or 5 scattered Tiger Symbols appears anywhere. During this feature you will have to choose a way to escape the tiger, if you escape you can be rewarded up to 100x the triggering bet. The Free Games feature can be triggered when 3, 4 or 5 scattered Professor symbols appear left to right on any row and you will receive up to 12 free spins. The professor will reveal a random free spins multiplier of 9x, 10x, 11x or 12x for each free spin awarded. To trigger the Match and Win Feature you must get 3, 4 or 5 purple gem symbols anywhere on the reels. You will then have to select from a grid of 12 purple gems until you match a pair and the feature will finish. 3, 4 or 5 scattered Map symbols appearing will trigger the Treasure Map feature and you will have to choose 1 of 5 coloured gems and if you match the gem with the one on the statue then you will be awarded 60x worth the triggering bet. If it doesn’t match you will still be rewarded up to 30x worth your triggering bet. There is also a gamble bonus round available. Another dynamite game to try is Imperial Destiny. To go back to our homepage. Click here!